We have a pretty medium-size Japanese maple on our front lawn. The leaves turn from green to red throughout the course of the spring and summer, culminating in a dark red in the fall. We also have a flower bed area around part of the house that popped out some daffodils and crocuses this spring, much to my happiness. But now, it’s bare. So I decided to add some color to our drab front yard. I bought two hanging planters (buy one, get one free!) with pink and purple petunias. One I hung from our front awning, and the other, I hung from a low branch of the Japanese maple. 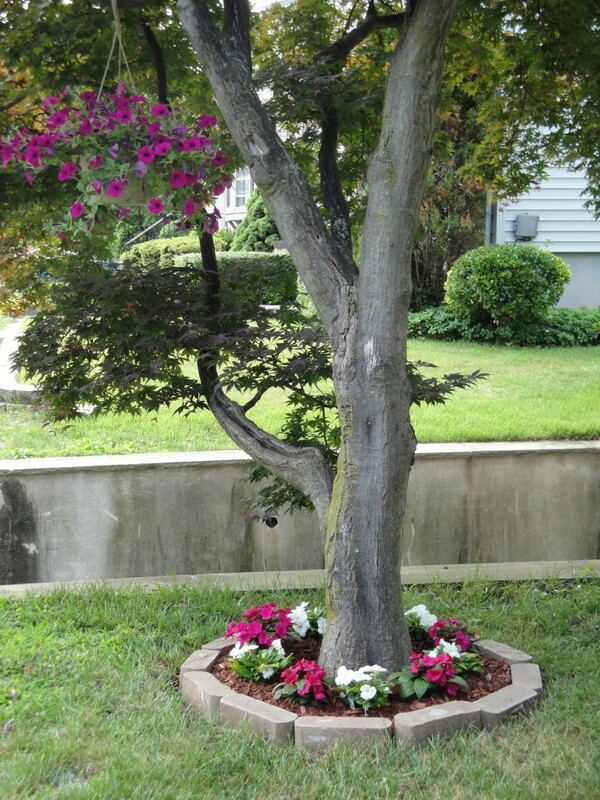 While at the nursery, I decided to put a small flower bed around the maple tree. Since the lawn is not sprawling by any stretch of the imagination, I kept it small. First, I used a hand fork to remove the grass. Then I leveled the dirt around the tree the best I could — I did run into a problem on one side where a major tree root skims the soil surface. I filled the ring halfway up with topsoil, and then planted my 10 New Guinea impatiens, which I purchased in white and pink, alternating colors as I went along. A thin layer of red cedar mulch topped off the planter, but I took care to keep the mulch away from the tree trunk, as advised on the packaging. Considering it’s my first attempt, I think it came out pretty good, no? We’ll see how it holds up during the summer, with all its thunderstorms here in the Northeast. 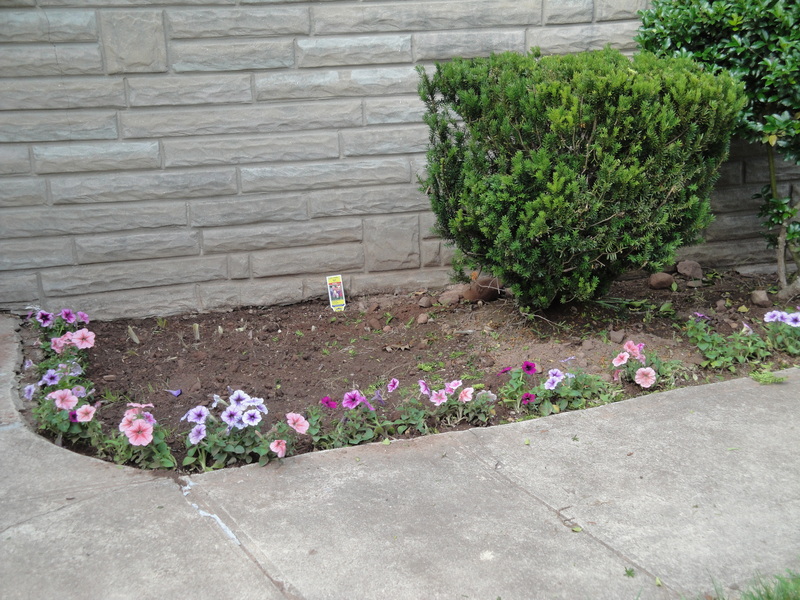 Two more flats of petunias line the edge of the flower bed, as I have yet to decide what else to plant there — probably some perennial greenery, perhaps a hydrangea or an azalea for added color punch. Here’s what that looks like right now. I relocated the daffodil bulbs to the rear of the flower bed for now and weeded the bed — the green is what I trimmed off the hedge after I’d planted the flowers (I wasn’t thinking ahead, obviously). 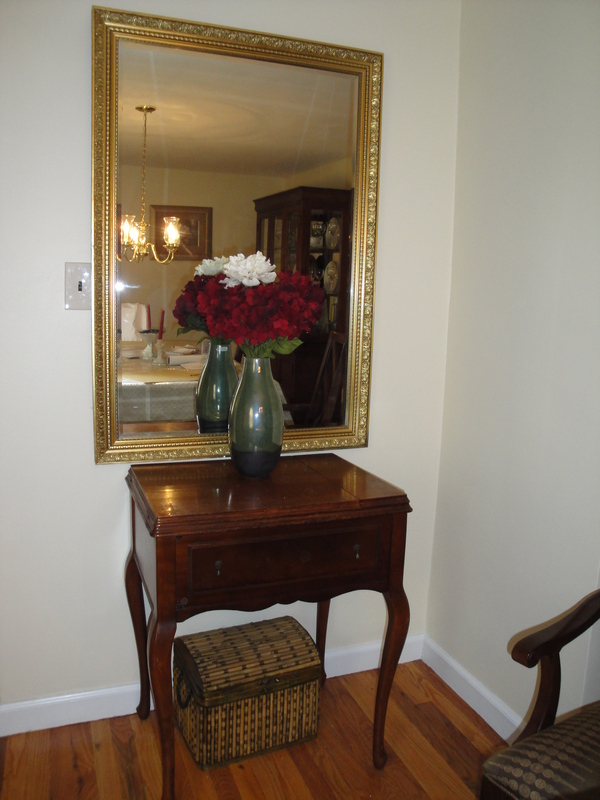 I also put up an antique gilded mirror that belonged to an aunt of my father’s. I centered it on a short wall in our dining room, which already has gold and red accents, but didn’t quite hang it high enough to give it space above my grandmother’s old sewing machine cabinet. Tomorrow, I plan to put up a new fixture in the kitchen — a fan with an included light kit. I also may tackle the sagging ceiling tiles in our first-floor bathroom. Your flowers look gorgeous! Great job! If you want some flowers that are beautiful, forgiving and will bloom all Summer, put in some Geraniums. I plant them every year, and they never fail to provide color all Summer long. They were Nana’s favorites and have turned out to be mine. The are very tolerant of heat, low water and last into the Fall. That looks beautiful. I can’t wait to get my own place so I can decorate my lawn. I like your fix it Fridays, very interesting reading. @Kevin: Thanks! Landscaping isn’t all it’s cracked up to be — we’ll see if I can keep these poor plants alive through the summer. I love petunias. They do okay out here in sunny CA, but last year my hanging petunia plant ended up getting too dried out in its coconut lined basket. I’ve learned that the coconut lined baskets just don’t hold enough moisture for an arid environment. However, you shouldn’t experience a problem at all due to the humidity. I love your border around the tree, you did a great job.